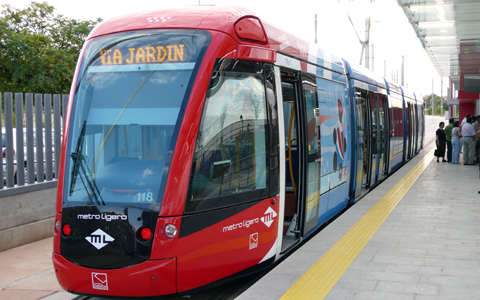 Light rail or light rail transit (LRT) is a form of urban rail public transportation that generally has a lower capacity and lower speed than heavy rail and metro systems, but higher capacity and higher speed than traditional street-running tram systems. The term is typically used to refer to rail systems with rapid transit-style features that usually use electric rail cars operating mostly in private rights-of-way separated from other traffic but sometimes, if necessary, mixed with other traffic in city streets. If this is the case, then under the law of many countries such systems are then legally tramways, although the vehicles which run on them are sometimes designated “supertrams”. Modern light rail technology is flexible and adaptable, and whether any given system is considered a true rapid transit system or not depends on its characteristics. With its mix of right-of-way types and train control technologies, LRT offers the widest range of latitude of any rail system in the design, engineering, and operating practices. The challenge in designing light rail systems is to realize the potential of LRT to provide fast, comfortable service while avoiding the tendency to overdesign that results in excessive capital costs beyond what is necessary to meet the public’s needs. Light rail vehicles (LRVs) are distinguished from rapid rail transit (RRT) vehicles by their capability for operation in mixed traffic, generally resulting in a narrower car body and articulation in order to operate in a traffic street environment. With their large size, large turning radius, and often an electrified third rail, RRT vehicles cannot operate in the street. Since LRT systems can operate using existing streets, they often can avoid the cost of expensive subway and elevated segments that would be required with RRT. Conversely, LRVs generally outperform streetcars in terms of capacity and top end speed, and almost all modern LRVs are capable of multiple-unit operation. Particularly on exclusive rights-of-way, LRVs can provide much higher speeds and passenger volumes than a streetcar. Thus a single-unit streetcar capable of only 70 kilometres per hour (43 mph) operating on an shared right of way is not generally considered “light rail”. The latest generation of LRVs is considerably larger and faster, typically of length of 29 metres (95 ft) with maximum speed around 105 kilometres per hour (65 mph). The term interurban (German Überland(strassen)bahn) is mainly used about rail-cars that run through the streets like ordinary streetcars (trams), but also between cities and/or towns, often through rural environments. In the period 1900-1930, interurbans were very common in the U.S., especially in the Midwest. Some of them, like the Red Devils, the J.G.Brill Bullets, and the Electroliners, belonged to this time’s high-speed railcars, with a commercial speed of up to about 145 km/h (90 mph). An important factor crucial to LRT is the train operator. Unlike rail rapid transit, traveling unattended with automatic train operation (ATO), the operator is a key element in a safe, high-quality LRT operation. The reason that the operator is so important is because the train tracks often run on roads with cars. If trains were automated on roads, a person wouldn’t be there to stop the train if a car pulled in front of it. Light rail trains are actually very heavy to prevent damage from impacts with cars. Thus, a train with ATO is not “light rail”. The philosophy of light rail is that a qualified person should be on each train to deal with emergencies, and while that person is there, he or she might as well operate the train. The cost of light rail construction varies widely, largely depending on the amount of tunneling and elevated structures required. A survey of North American light rail projects shows that costs of most LRT systems range from $15 million per mile to over $100 million per mile. Seattle’s new light rail system is by far the most expensive in the U.S. at $179 million per mile, since it includes extensive tunneling in poor soil conditions, elevated sections, and stations as deep as 180 feet (55 m) below ground level. These result in costs more typical of subways or rapid transit systems than light rail. At the other end of the scale, four systems (Baltimore MD, Camden NJ, Sacramento CA, and Salt Lake City UT) incurred costs of less than $20 million per mile. Over the U.S. as a whole, excluding Seattle, new light rail construction costs average about $35 million per mile. By comparison, a freeway lane expansion typically costs $20 million per lane mile (a lane mile is a mile-long lane) for two directions. Since a light rail track can carry up to 20,000 people per hour as compared with 2,000-2,200 vehicles per hour for one freeway lane, light rail could theoretically deliver significantly more congestion-reduction potential per dollar as incremental freeway lanes in congested urban areas. For example, in Boston and San Francisco, light rail lines carry 9,600 and 13,100 passengers per hour, respectively, in the peak direction during rush hour. Combining highway expansion with LRT construction can save costs by doing both highway improvements and rail construction at the same time. As an example, Denver’s T-REX (Transportation Expansion) project rebuilt interstate highways 25 and 225 and added a light-rail expansion for a total cost of $1.67 billion over five years. The cost of 17 miles (27 km) of highway improvements and 19 miles (31 km) of double-track light rail worked out to $19.3 million per highway lane-mile and $27.6 million per LRT track-mile. The project came in under budget and 22 months ahead of schedule. However, Calgary’s LRT ridership is much higher than any comparable U.S. light rail system at 300,000 passengers per weekday, and as a result its efficiency of capital is also much higher. Its capital costs were ⅓ that of the San Diego Trolley, a comparably sized U.S. system built at the same time, while by 2009 its ridership was approximately three times as high. Thus, Calgary’s capital cost per passenger was much lower than that of San Diego. Its operating cost per passenger was also much lower because of its higher ridership. A typical C-Train vehicle costs only $163 per hour to operate, and since it averages 600 passengers per operating hour, Calgary Transit estimates that its LRT operating costs are only 27 cents per ride, versus $1.50 per ride on its buses.